GIGA GRANADA HILLS: Petaluma Poultry At How's Today: Really Better? Petaluma Poultry At How's Today: Really Better? Today at How's Market (11900 Balboa Blvd.) 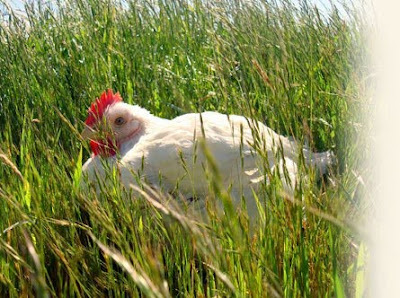 from 12:00pm - 5:00pm, Petaluma Poultry will be doing a promotion of their organic chicken, and you may know Petaluma for their "Rocky" and "Rosie" chickens. "As a pioneer and leader in the natural and organic food industries, we are dedicated to sustainable farming practices that renew natural resources. Our goal is to produce the finest natural and organic poultry products while reducing waste, preserving our environment, supporting our employees' comfort and efficiency, and contributing to our local communities. " They've even got this picture of a chicken sitting in the grass on their website. 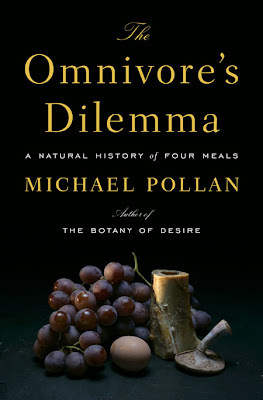 I wish there was such a thing as a guilt-free grocery store chicken, but Rocky and Rosie don't let us off the hook, and the pair are specifically examined in Michael Pollan's outstanding book The Omnivore's Dilemma. Compared to conventional chickens, I was told, these organic birds have it pretty good: They get a few more square inches of living space per bird (though it was hard to see how they could be packed together much more tightly), and because there are no hormones or antibiotics in their feed to accelerate growth, they get to live a few days longer. Since the food and water and flock remain inside the shed, and since the little doors remain shut until the birds are at least five weeks old and well settled in their habits, the chickens apparently see no reason to venture out into what must see to them an unfamiliar and terrifying world. Since the birds are slaughtered at seven weeks, free range turns out to be not so much a lifestyle for these chickens as a two week vacation option. Pollan's conclusion is that "The chickens lived only marginally better lives than their conventional counterparts," and says that "the lot of the workers who... gathered up Rosie for slaughter is not appreciably different from those on nonorganic factory farms." The good news is that Pollan finds that the Petaluma chickens taste a bit better: "Rocky and Rosie both taste more like chicken than mass-market birds fed on a diet of antibiotics and animal by-products, which makes for mushier and blander meat." I did have an opportunity to obtain and roast a truly free range organic chicken recently, and it was lovely -- robust flavor, and no guilty aftertaste. The chicken had been allowed to wander in grass, eat bugs, and have a beak, unlike the common Zacky or Foster Farms-type mass-produced chickens imprisoned in torturous, minuscule cages. The main drawback was the fact that a friend had to drive all the way up to a small farm in Ojai to get it. He took his biodiesel car, but still, that's a heck of a lot of miles for a grocery run. So is Petaluma Poultry the way to go? As imperfect as they may be, if you live in Granada Hills and don't have the luxury of being able to drive all the way up to Ojai to pick up a shame-free bird, these organic yet not-so-free-range chickens with the overhyped backstory are, for the time being, at least a slightly better option. at most local farmers markets. I didn't know that -- I usually think in terms of produce when I think of farmer's markets. Thanks for the tip! But I just keep wishing the day will come when I can stroll into the supermarket and get a humanely raised, antibiotic- and pesticide-free chicken, instead of making that special Sunday morning trip to the Farmer's market. Linda, not all farmers' markets are on Sundays. Chatsworth/Porter Ranch and Canoga Park have their markets on Saturdays. The Northridge farmers' market is on Wednesdays. The Van Nuys farmers' market is on Thursdays. The Encino market is the only local one on Sundays that I know of. Good point Aaron, and thanks for the info. I was just using "Sunday" as shorthand for "highly scheduled, once-a-week event. The 24-hour supermarkets were created for disorganized, bad-at-remembering-schedules folks like me -- I wish they also had non-factory chicken.